Georgia is a country that has recently entered the imagination of travellers. It has some of the highest and most spectacular mountain peaks in Europe, lakes and rivers so beautiful they could persuade a Norwegian to emigrate, and meadows that are so green and flower-filled after snow-melt as to be almost psychadelic. It also has incredible cities as ancient as Rome and Constantinople, and fabulous ancient monasteries. Bordered to the north by Russia and jagged spine of the Greater Caucasus, Georgia is surrounded on its other three sides by Turkey, Armenia and Azerbaijan. In the past Persians, Russians, Turks have all fought over Georgia, but now, at last, the country enjoys cordial relations with all. Georgia was once an important staging post on the Silk Road; and yet some of its valleys are so cut off from the world that they have their own, distinctive languages and even today have no electricity and internet. The Greeks came here for its gold — indeed it was to the Georgian Kingdom of Colchis — legendarily ruled by Medea — that Jason came in his quest for the Golden Fleece. It is still said that if you were to leave a sheep’s fleece it in a stream in Svenati for a week, it would become impregnated with gold! Tbilisi is a compelling and fascinating city, a vibrant, aspirational modern European capital with a landmark bridge by Italian architect, Renzo Piano. Despite its nod to contemporary cool, it still retains a gorgeous medieval core and castle, a glorious Ottoman bath-house and Soviet periphery that would make a perfect backdrop for any Cold War movie. The historic centre is tiny, with every other shop selling wine! Georgians are inordinately proud of their wine, and though several countries — including Armenia — claim to be its birthplace, Georgia’s claim is probably the strongest as the earliest traces of the wine-making grape, vitis vinifera anywhere in the world have been found in a village near Tblisi. Georgia’s most famous grape is the saparavi — unique for having both red flesh and skin — and in recent years has become highly considered in international wine-circles. Tbilisi is a marvellous little place to explore, its medieval centre built of biscuity brick, with evocative 6th and 7th century churches, several ancient thermal bathhouses, a fabulous museum displaying some astonishingly fine gold craftsmanship, and an underground wine cellar where we get to try some of Georgia’s reds. It is perhaps outside the capital that Georgia makes the deepest impression on travellers. Journeying through this land, one has a sense of being somewhere whose roots and traditions lie completely outside Europe. This is partly down to the country’s extraordinary topography, with its high, rugged snow-capped mountains and hidden valleys, partly to the fact that it lies on the cusp of Europe and Asia. Perhaps it is also due to the fact that, despite the Ancient Greek gold-rush and the Silk Road, many parts of Georgia remained completely cut off from the rest of the world. Somehow visiting Georgia’s monasteries and churches feels like taking a step right back to the very roots of Christianity. 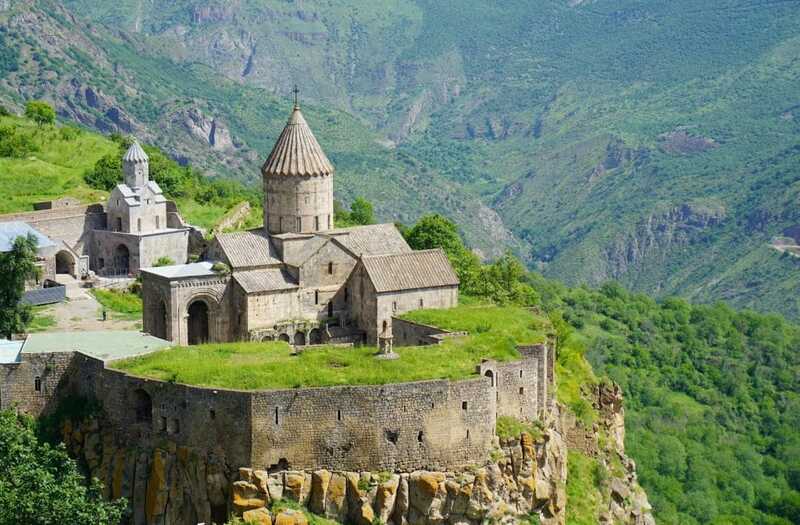 One of the true highlights is the spectacular rock-hewn monastery of Vardzia, which is not unlike similar complexes in Cappadocia and remarkable for its well-preserved frescoes. We travel in early June, after the snow has melted on the roads and before the intense heat of summer begins to burn the Armenian steppe. It is an ideal time to travel and a superb introduction to these two fascinating countries.